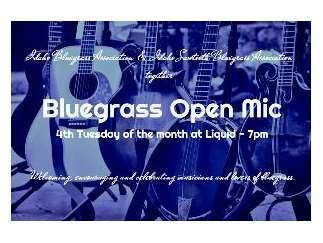 Idaho Bluegrass Association, Idaho Sawtooth Bluegrass Association, and Liquid Lounge are hosting a Bluegrass Open Mic at 7:00 pm every 4th Tuesday of the month at Liquid (405 S 8th Street, Boise, ID). If you are a performer with a band, a new performer with an ensemble, or a group of friends with a few good licks, then the open mic is for you. Or just show up and listen. More information and a sign up form can be found on the Idaho Bluegrass Association's Web page at http://www.idahobluegrassassociation.org/Open-Mic.html. Welcoming, encouraging and celebrating musicians and lovers of bluegrass.